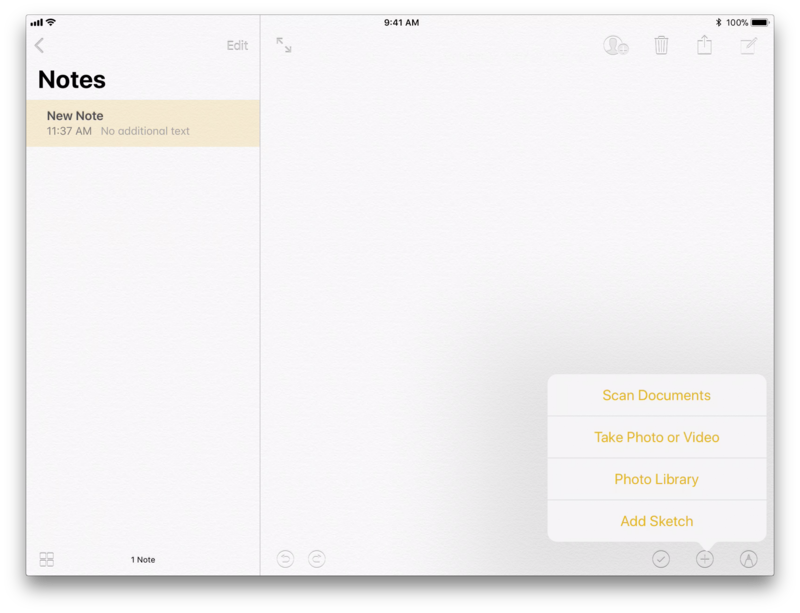 Among the abundance of new features introduced with the release of iOS 11 last month was an enhancement to the built-in Notes app, which now allows you to quickly and easily capture documents with your iPhone or iPad’s camera. 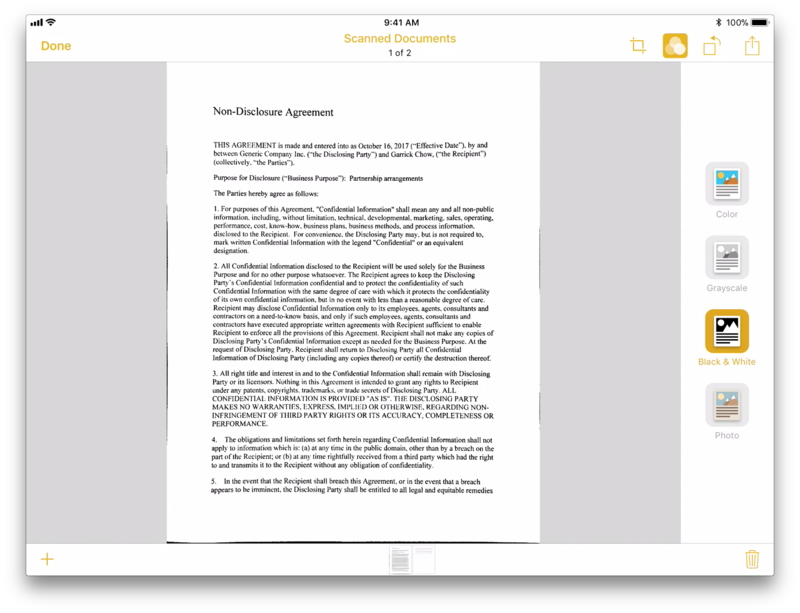 You can then annotate or sign the documents with the Note app’s built-in markup tools. With this new feature, you no longer have to go through the tedious process of printing a document on paper, signing it, and scanning it in again, just to email it to someone. Open the Notes app and create a new note. Then tap the + button, and choose Scan Documents. That opens your device’s camera. Before pointing the camera at your documents, you can adjust some settings. For example, if your iPhone or iPad has a built-in flash, you’ll see the option to turn the flash on or off, or leave it set to Auto to let the camera determine if the flash is needed. You also have the option to capture the document in color, grayscale, black & white, or as a full photo. Regardless of which you choose, you’ll be able to change your mind after you capture the image, so it’s ok to leave it at the default setting. And then you can choose between Auto and Manual capture. With Auto selected, the scanner will automatically take a photo when it detects the entire document in the frame. Switching to Manual requires you to tap the shutter button yourself. I recommend keeping it set to Auto, especially if you have multiple pages to scan. To get the best results from your scans, make sure the document is sitting on a flat surface, and that there’s enough contrast between the document and the surface it’s on. 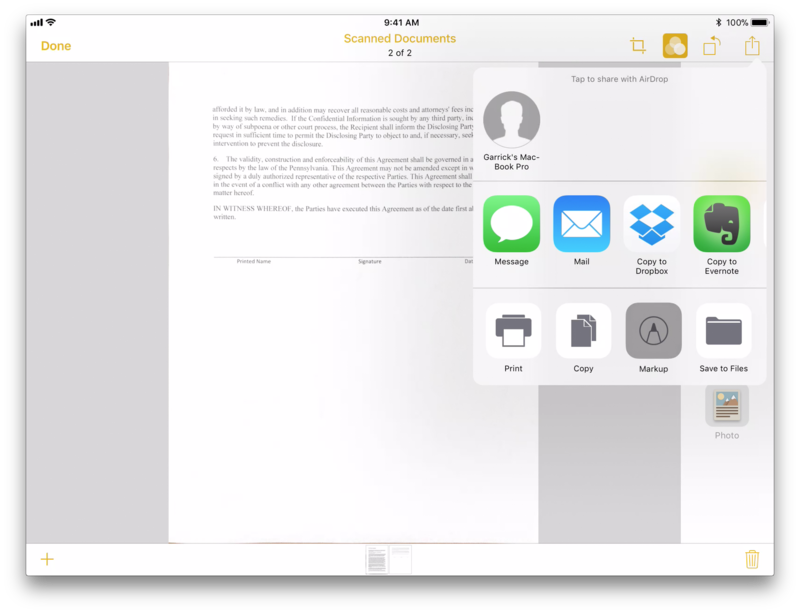 Then hold your iPhone or iPad as close as possible to the document while keeping it entirely onscreen. 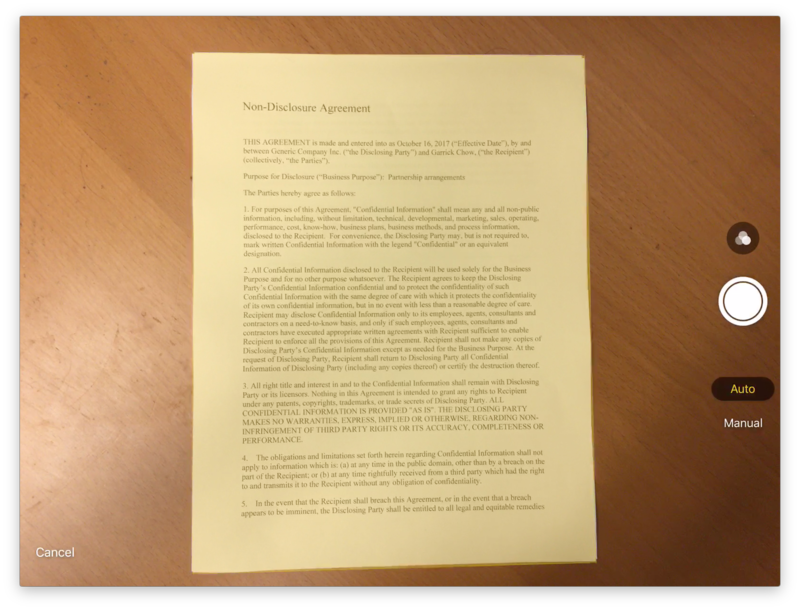 In Auto mode, a yellow highlight appears around the document as it’s being detected, and in a few seconds you’ll hear a shutter sound as it takes a photo. If you have multiple pages to scan, place the next page in view and hold your device over it again. Keep repeating this process until all the pages are captured. Once you’re done, tap the Save button. Your scanned pages now appear in the note you created. Tap the scanned pages to open them in editing mode. In Editing mode, you’ll find tools to adjust the crop, color, and rotation of the document, although you’ll probably find that the scanner does a pretty good job of cropping around just the document, and also that it keeps the document at the proper orientation. Take a moment to try the different color settings though, to see which makes your document look best. 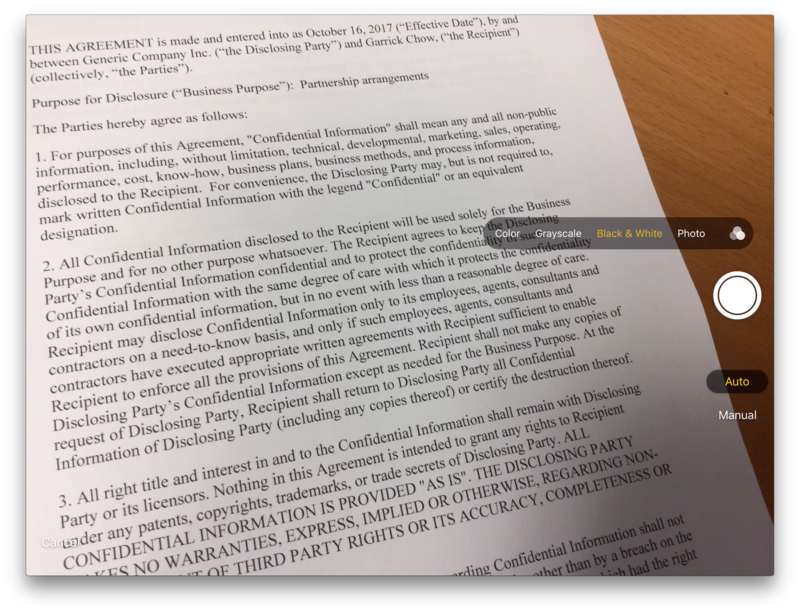 To make annotations or to sign the document, tap the Share button, and select Markup. This gives you access to the entire collection of Markup tools, which you can use to write, highlight, or draw on the document. Tap the + button and select Signature to add your signature and place it in the document. 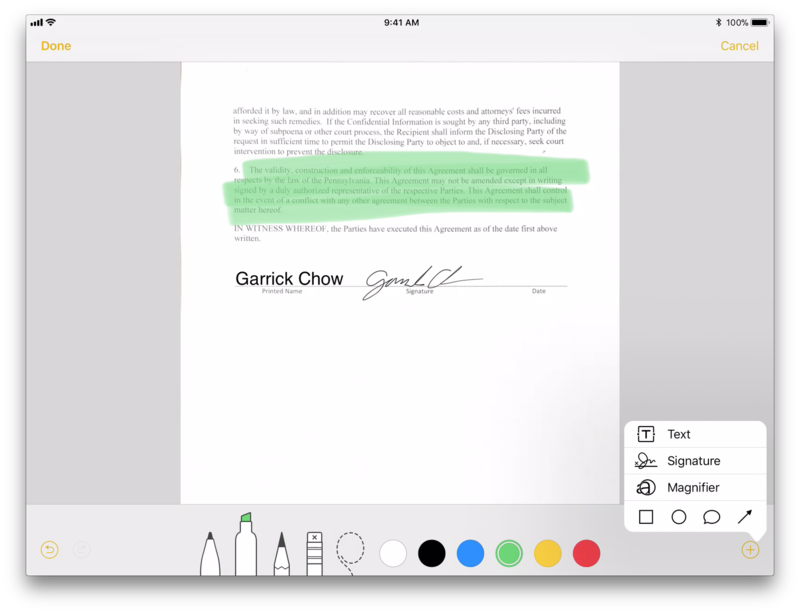 If you’re using an iPad Pro, you can use the Apple Pencil to get a more accurate version of your signature than what you’ll most likely be able to achieve by signing with your finger. Once the document is marked up and signed, you can tap the Share button again to immediately attach it to an email, send it via Messages, or use any of the other available options for sharing the document with others. For more info on the latest version of iOS, check out the LinkedIn Learning course iOS 11: New Features. For a deep-dive into using iOS 11, see iOS 11: iPhone and iPad Essential Training.